Praz-Delavallade is pleased to announce their second solo-exhibition by Los Angeles based artist Sam Durant. Through his drawings, sculptures and installations, Sam Durant explores the realms of pop culture, history and memorialization in order to question the values of American society. 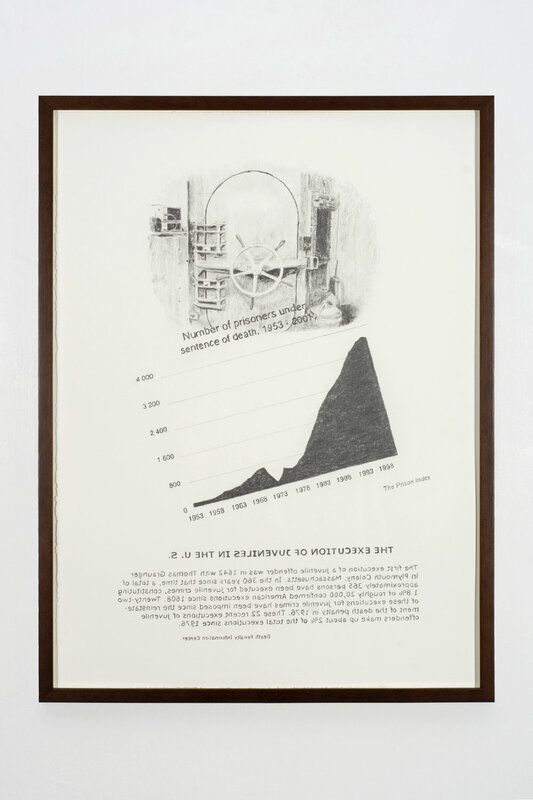 Political involvement is at the core of his practice, reflected in his interest in the various counter-culture manifestations and protest movements as well as in his examination of the socio-political aspects of Art. In his installation “Abolition”, presented in the gallery’s original space, Durant continues to display his fascination with the representation, throught art, of social and political dilemma; and address the problems of representing of political issues in art work. 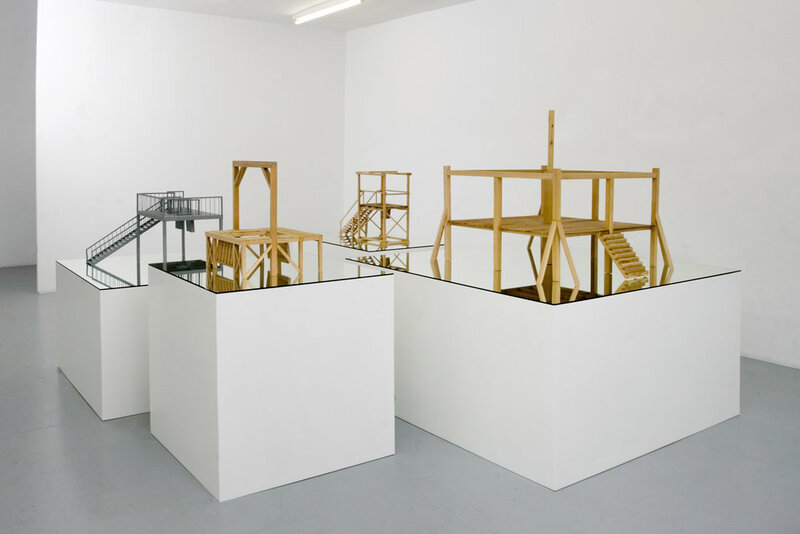 Sam Durant illustrates his indictment of the death penalty through this installation of reduced scale models of historically significant gallows retracing the history of death by hanging from the early colonial days of America to the execution of Saddam Hussein. By confronting the viewer with these objects, Durant seeks to highlight a current social problem, which he places in its proper perspective through an historical approach. Racial and social disparity are the key to the artist’s interest in the subject and affirm the continuity between this project and previous ones, such as Altamont Raceway CA (1999) or Upside Down : Pastoral Scene (2002) already centered on the same concerns. The minimal interest elicited by the question of the death penalty in the public debate of the current presidential campaign, is evidenced by the candidates careful avoidance of the subject. Underlined, as well, is the basic contradiction in the people’s mindset: A majority remains in favor of the death penalty, while considerable divisions exist on the right to life, as involved in the abortion debate. The gallows are displayed on mirrors, mirrors being often present in Durant’s work. A clear homage to Robert Smithson, the mirror interests Durant because of its potent symbolic charge. Evocative of both reflection and reflexion - physical and intellectual - a mirror suggests the creation of a perspective leading to an infinite number of interpretations. The viewer finds himself involved in the work, both through the reflected image and his own reflexion process. 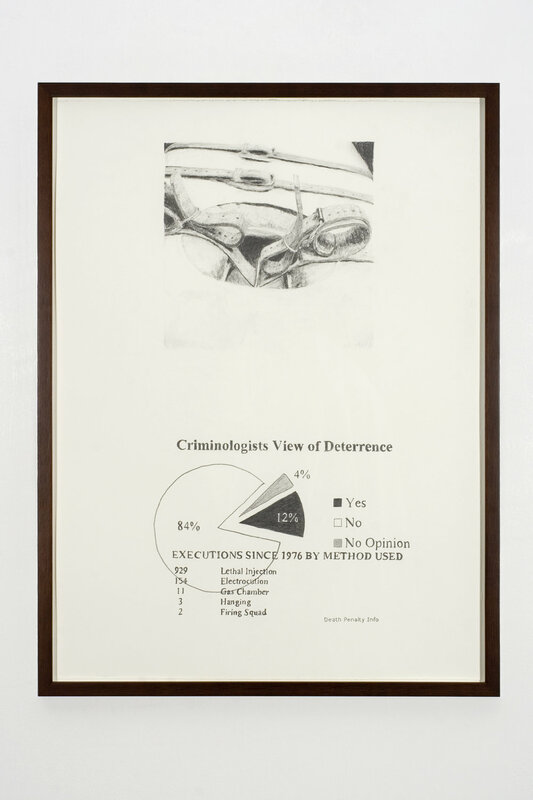 This body of sculpture is completed by a series of drawings in which the artist inventories the various methods of execution, associating them to statistical data on incarceration and the death penalty. This works as a sort of reference index, retracing the thoughts and associations in the artist’s mind during the elaboration of his project. Thus, through the medium of drawing, Sam Durant transfers a socio-political subject into the artistic sphere. In the second space of the gallery, the artist chose to present a less recent installation (2000), which reveals his artistic strategy designed to establish connections between various domains of reference. This particular installation is descended from an earlier project, Proposal for Monument in Friendship Park, Jacksonville, Florida (1999), a theoretical proposal for a monument to Southern Rock, a musical genre allegedly born in that park in Jacksonville, FL. In the course of his research Sam Durant was led to discover connections to the work of the Japanese-Americain artist Noguchi. He became interested, in particular, in parks and gardens where Noguchi blends urban materials, like concrete with others, taken from the traditional Japanese garden (UNESCO’s garden in Paris, for instance). In his writings Noguchi referred to the rocks in a traditional garden as being protuberances and that they connected below the surface to the primordial mass. “I found this idea very interesting as I imagined all the elements in my project to be connected by the music.” In his work criss-crossed by multiple references, rock, a popular music genre that connects the masses, now appears as the binding agent between the various elements, the stones, the rocks.